This month is my turn to host for Malaysia Food Fest. Last month was Pahang and please visit Wendy's blog for the round up. 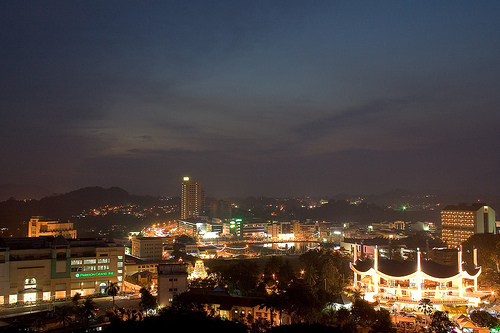 I was born and raised in Seremban,Negeri Sembilan and now living in Seremban too.Seremban is capital of Negeri Sembilan. The name Minangkabau is thought to be a conjunction of two words, minang ("victorious") and kabau ("buffalo"). There is a legend that the name is derived from a territorial dispute between the Minangkabau and a neighbouring prince. To avoid a battle, the local people proposed a fight to the death between two water buffalo to settle the dispute. The prince agreed and produced the largest, meanest, most aggressive buffalo. The Minangkabau produced a hungry baby buffalo with its small horns ground to be as sharp as knives. Seeing the adult buffalo across the field, the baby ran forward, hoping for milk. The big buffalo saw no threat in the baby buffalo and paid no attention to it, looking around for a worthy opponent. But when the baby thrust his head under the big bull's belly, looking for an udder, the sharpened horns punctured and killed the bull, and the Minangkabau won the contest and the dispute.That is why the houses and buildings in Negeri Sembilan often has a special roof that looks like the horns of the buffalo. When we talk about the food in this state, traditional Negeri Sembilan food is famous for being fiery hot and spicy. They use alot of santan (coconut milk) and chilli in cooking. Methods of cooking like Masak Lemak Cili Api and Rendang are typical Minang cuisine and they are cooked with a liberal use of with chili and coconut. It literally translates as "Cooked in coconut milk and bird's eye chilli. This is one of the signature dishes of the Minang cuisine. 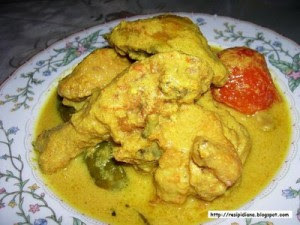 You can use chicken,seafood,mushroom,vegetable, eggs, fish, or even sardines to cook masak lemak cili api. It's a very versatile cooking style. Ayam Masak Lemak Cili Api. 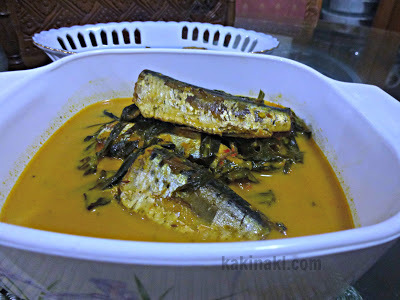 Masak Lemak Cili Padi Pucuk Ubi. 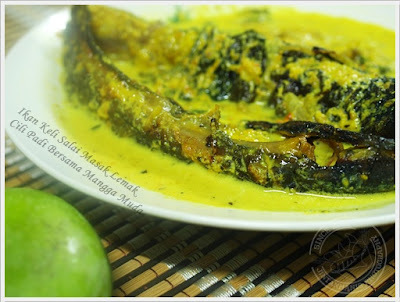 Cendawan Masak Lemak Cili Api. Negeri Sembilan also has many types of Rendang. Rendang cooked in typical Minang style does not use spices but with aromatics like ginger, galangal, lemongrass and lots of coconut . 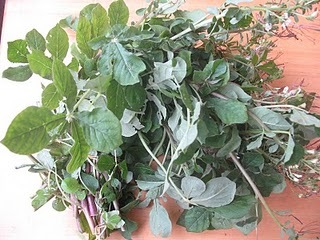 I'm sure most of you will be familiar with beef rendang and chicken rendang, but in Negeri Sembilan, almost anything can be made into rendang and that includes ferns and shoots of plants that is normally not used in cuisine of other states. 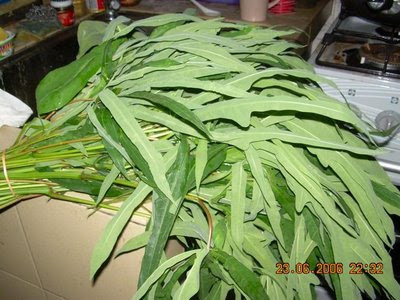 This is how Daun Puding look like.Negeri Sembilan people like to use it to cook Rendang Daun Puding. 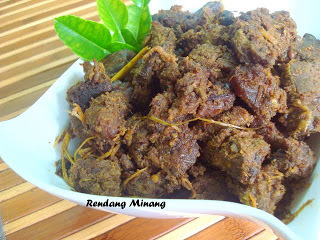 The picture below is rendang made with the shoots of the cassava (ubi kayu) plant. 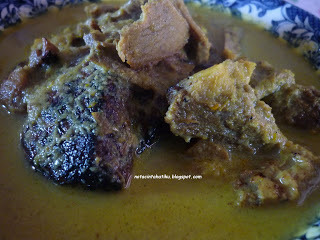 This is another popular Rendang dish.Rendang Maman is the signature dish of Gemencheh town for all festivals and celebration.Maman leaf can be found easily in Gemencheh,Negeri Sembilan.This leaf is a bit bitter in taste.When you cook this rendang, you can not stir it often. If not the rendang will become bitter. 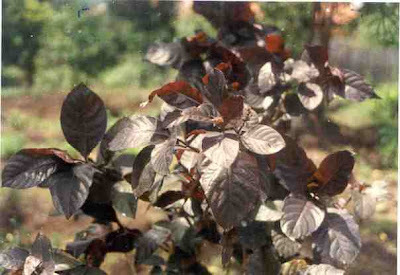 Maman is consumed in the northern states as well, usually pickled and not in this manner. You will thinking what is Salai?Salai mean smoked. 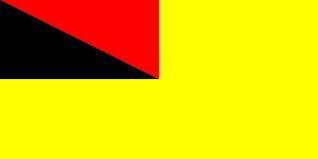 Negeri Sembilan people like to smoke chicken,bird,duck, beef or fish to cook Rendang and Masak Lemak Cili Api. The smoked meat gives the Rendang and Masak Lemak Cili Api a smoky taste and makes it more fragrant. One can easily find smoked meat sold at the road side on the way to Bahau.You will see the smoked chicken,duck or bird hanging at the small stall. 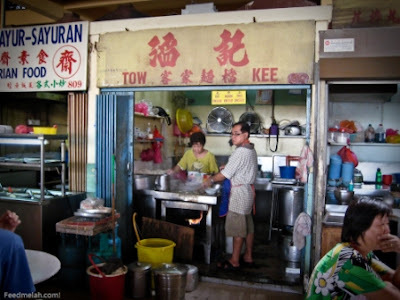 Say about Seremban, I think everyone will think about Seremban Siew Pau( Fu Yong Siew Pau ).Siew pau is a baked bun with pork or chicken filling. The difference is that the meat filling is flossed, instead of cut into cubes.This snack is a very famous and a must buy as a gift when visit Seremban. Beside Seremban Siew Pau, Seremban is also famous for 3 noodles, namely Seremban Beef noodles, Hakka Mee and Noodle and Cuttlefish Meehoon ( Yau Yu Mai Fan ). 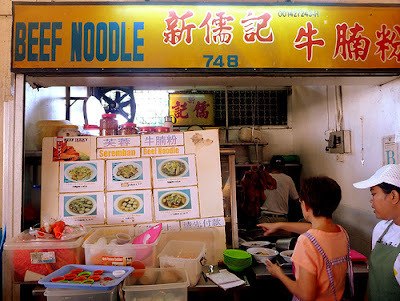 These 3 famous noodles stall is located at Pasar Besar Seremban ( Wet Market ).So if you don't take beef ,you also can try the another 2 noodles. Seremban Wet Market can be said as a famous place to have breakfast. Who can join?Anyone can join. Prepare a dish (sweet or savoury) from Negeri Sembilan.Then take a picture of the food you have cook.Please read FAQ on what make the dish localized dish. Provide a recipe that is credited (from books,internet,friends,family or maybe by your own,be specific).Submission without stating recipe source will not be accepted for all form of submission. Submit your entry latest by 31 January 2013,exept for Facebook submission. 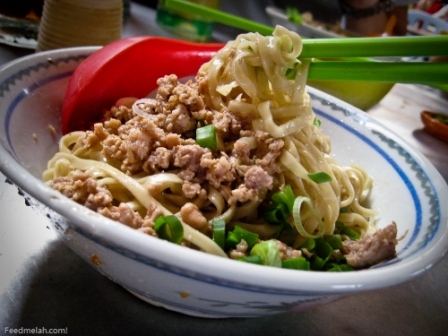 Prepare a dish (sweet or savoury) from Negeri Sembilan. Blog about it from 1 - 31 January 2013. 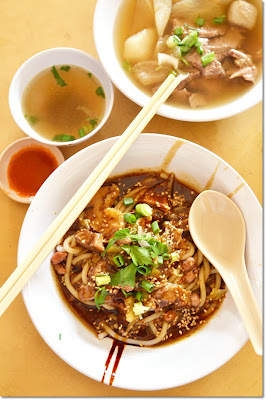 Blogger can post old recipe on Facebook,if you have cook and post Negeri Sembilan dish before in your blog. For a pictorial guide on how to submit via Facebook,please click here. For non Facebook user or Blogger. A round up will be done on 1 February 2013.Facebook entries are not included in the round up. Looking forward Seremban dishes. My in law in Seremban. I used to travel back during CNY. Hardly have breakfast at the wet market. After seeing your intro shall try for the coming CNY. Thanks for hosting! OMG... the rendang dishes look crazy good!!! I'm salivating already just from looking at the photos... must choose one to make. hopefully a senang senang one! 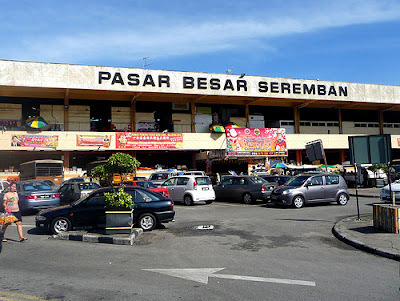 My husband hometown is in Seremban, but he never bring me to Pasar cari makan. Shall make a visit next time. By the way, good write up! 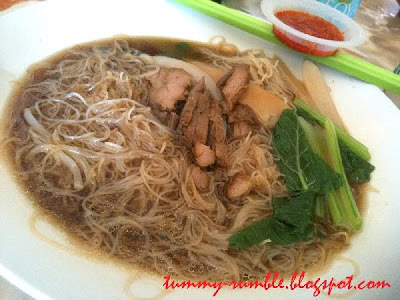 Thank you Wendy too...she help me a lot..
Hi, Hody may I know can I submit the "imitate" Yi Poh Loh Shu fun as Negeri Sembilan Food Fest dish? TQ! 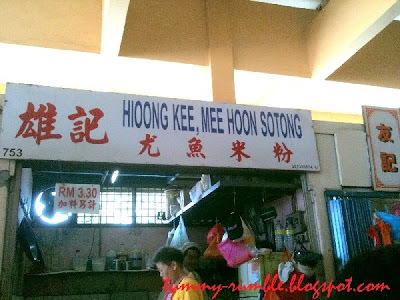 can also...yi poh loh shu fun also famous in seremban..
how about rendang pegaga? . do you have the recipe? ada cdgn tak kedai makan cina bdekatan garden avenue seremban 2?ank sdara sa mnuntut d Uitm srmban n tgl area ni.org sabah mmg biasa mkn mknn cina..yg ngam utk budget plajar klu ada..